Not having the right accessories for your BBQ grill is like not having the right cooking utensils in your kitchen. It makes the job alot harder. Having the right resources to work with speeds up the process and eliminates problems. 1. All of our grates and grids come preformed in four sections. for easy removal of one section at a time. 2. Keep your steak sizzling on one area while removing one section & replacing with our Griddle/ Hotplate or our Veggie Wok. 3. Makes adding more coal a cinch. Pop out one section vs the whole grate. 4. Use our Cast Iron Handle to easily remove a section. 5. Our Grill Brush is superior with stainless steel bristles. Let's face it, veggies aren't always the first food we want to eat off of our plate. But times are a changing and those old boring canned vegetables that many of us grew up with have taken a back seat to fresh and healthy produce especially when cooked on the grill. Our Veggie Wok is perfect for cooking small fresh cut veggies like diced onion, peppers and mushrooms without the worry of them falling through the gaps of the grate surface. You can also use it to cook green beans, corn off the cob and so on. If you've never barbecued or cooked vegetables on the grill - you have no idea what you're missing. It's like a whole new world! 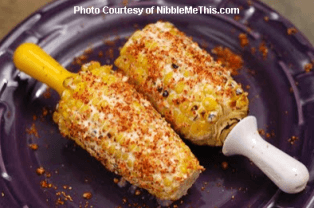 Once you eat corn on cob that's been cooked on the grill, it's hard to eat it cooked any other way. Check out just one example below of what you can do with veggies when using our cast iron grids on your large Egg, Primo or Grilldome. Directions: Clean all the veggies carefully wiping the mushrooms with a damp cloth. Cut the sweet red and orange pepper into 1" squares. Slice the zucchini into 3/4" thick slices. Blend the oil and Italian seasoning. Thread the veggies on individual skewers and place on a cookie sheet lined with foil. Brush the skewers with the olive oil blend on all sides. Sprinkle evenly with the Ramono cheese and grill 5" inches from the coals for 8-10 minutes turning several times until gently charred. If using the Veggie Wok: Combine Olive Oil, Italian Seasoning and Ramono Cheese in a large ziplock bag. Toss in the veggies and close. Gently squeeze the bag to coat with the oil mixture. Drain the oil and place the vegetables in the wok. Cook & toss 8-10 minutes until slightly tender and charred.